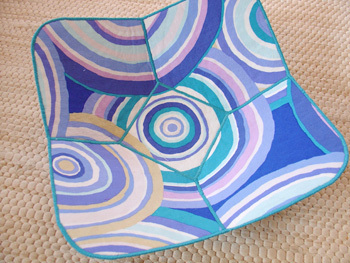 I got this gorgeous Kaffe Fassett "Target" fabric from Dani and thought I'd use it to make something for her birthday. I asked myself what could I sew up that a knitter could use? Why, a beautiful bowl to hold, what else, yarn! 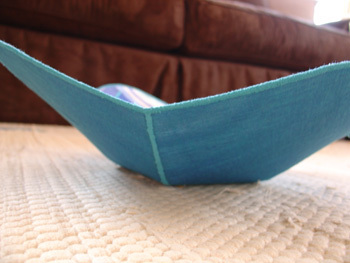 I grabbed some of Kaffe Fassett's shot cotton in teal for the bottom and followed the instructions from Fast, Fun and Easy Fabric Bowls which I first heard about on this episode of Simply Quilts. There were some new techniques in it for me, but nothing too difficult. It came out so well I couldn't help but start putting things in it until I had to wrap it up!